Stephen Acaye holds a cassava root for sale in his stall at the Gulu Main Market in northern Uganda. At the Gulu Main Market in northern Uganda, there’s an entire aisle devoted to cassava vendors. For Ugandans, the starchy tuber is more than a staple food crop. It helped people survive many years of war. A project led by the Danforth Plant Science Center in Creve Coeur to develop genetically modified cassava is undergoing field trials in East Africa. “During the time of displacement, we had a food shortage, and this was the savior,” cassava vendor Stephen Acaye told a translator at the market. Here, there’s an entire aisle devoted to cassava vendors, but Acaye’s stall is one of the busier ones. 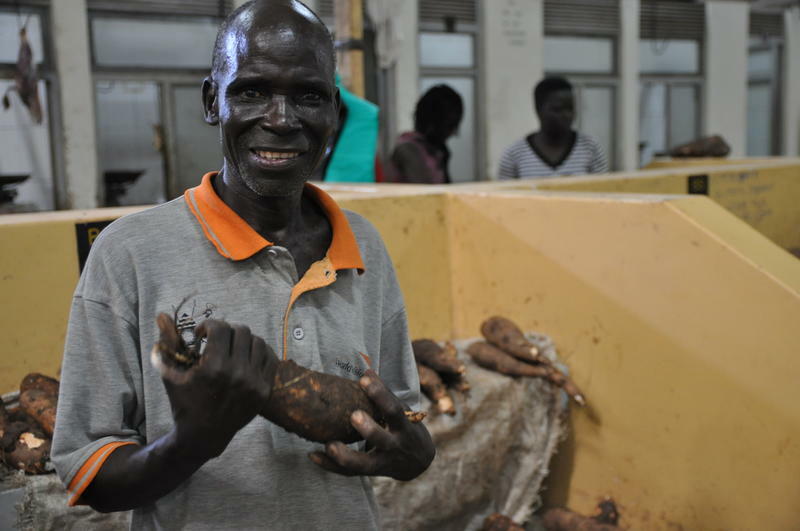 He’s sold the heavy, starchy tubers for about 10 years, since his family returned to Gulu. In 2002, Acaye’s 11-year-old daughter was abducted by the Lord’s Resistance Army, and the family was sent to a refugee camp. “It was difficult to protect us so the government decided everyone moves to a displacement camp," Acaye said. "Against our will, we went. And I can tell you that it was very insecure there." At the time, aid organizations started to distribute cuttings of a fast-growing cassava variety that can be eaten in six to nine months. Cassava can be boiled, steamed or mashed. Ugandans also add cassava to beans or use it to make chips, crisps or croquets. When Acaye and his family returned home, the starchy tubers that can grow in tough soil saved them from going hungry. “Eventually, when people moved back home they went with the cuttings and multiplied it more from home,” he said. Acaye doesn’t know his daughter's fate. But like many parents in the northern region, he won’t give up hope that she’s alive. Joyce Mamgulu snaps off uprooted tubers from the stem of a cassava plant in the garden she cultivates near Aiylo camp in the Adjumani District of northern Uganda. Mamgulu lived in the South Sudanese city of Bor when war broke out and her family had to flee. Just a couple hours north, near Uganda’s northern border with South Sudan, new refugees also are growing cassava to supplement their diet. Joyce Mamgulu, 27, who fled South Sudan with her family in 2013, is one of the lucky ones. Though most refugees are experiencing food shortages and ration cuts, she grows her own food on several acres just outside of a United Nations refugee settlement in the Adjumani District. Mamgulu became friends with the Ugandan owners of the land, who allow her to use it in exchange for a share of the harvest. Cassava is one of her key crops. Today, Mamgulu no longer receives food rations from the World Food Programme. 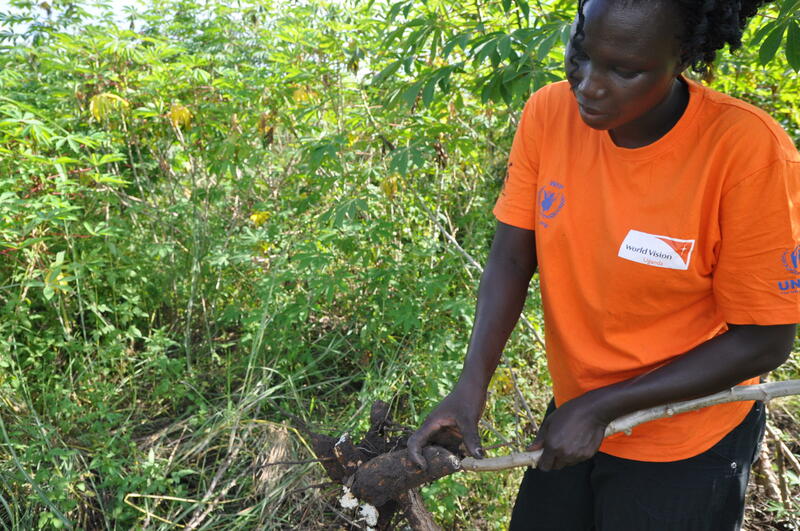 After our interview, she carefully uproots a cassava plant and replaces it with a stem cutting so it can grow again. She takes the tubers, knocks them together to shake off the dirt, and carries them back to the refugee camp. This time, there’s enough to share. Translations from Luo courtesy of Peter Labeja. Follow Durrie on Twitter: @durrieB. St. Louis Public Radio health reporter Durrie Bouscaren is visiting Uganda for a fellowship with the International Women’s Media Foundation. Her reporting will focus on Uganda's debate over genetically modified crops, as well as projects that were initially developed in St. Louis for use in East Africa. As botanist Nigel Taylor moves through a greenhouse kept to 90 degrees Fahrenheit and 80 percent humidity, he checks the stems of young, potted cassava plants. Call it manioc, tapioca or cassava — this starchy, tropical tuber feeds millions of people around the world. In many parts of East and Central Africa, farmers are experiencing declining yields of cassava due to brown streak virus, a plant disease that can render a crop inedible. For the past decade, scientists at the Donald Danforth Plant Science Center in Creve Coeur have led a project that tries another tack: genetically modifying cassava plants for disease resistance. Updated 3 p.m., Sept. 28 with Durrie Bouscaren's interview on St. Louis on the Air from Uganda. 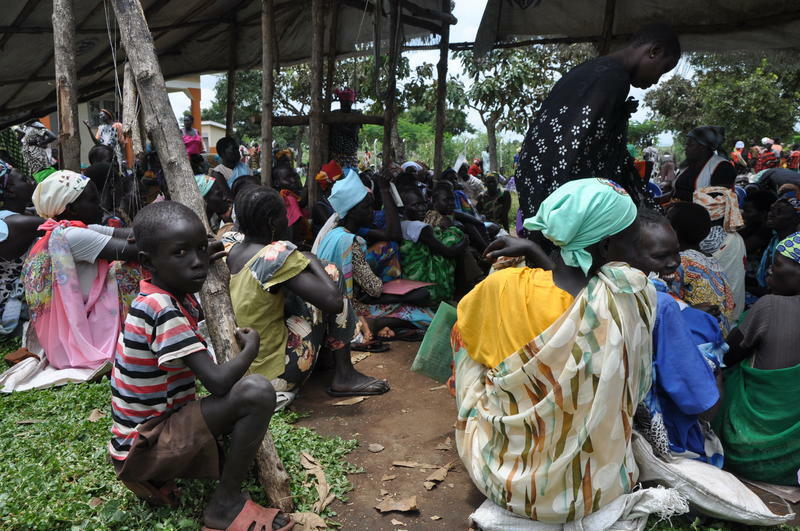 Heavy fighting in South Sudan has pushed about 150,000 refugees across the border into Uganda over the past two months. In July, the World Food Programme cut food rations in half for residents of settlement camps who have been in the country for more than a year. The toll of the conflict is clear in refugee camps in the Adjumani District, near Uganda's northern border.